Shipping and Handling: $3.00 for single copy shipment to the United States. Or send $13 and your address to Stran L. Trout, 7200 Lakeshore Dr., Quinton, VA 23141. Stran L. Trout is a retired Virginia attorney, a past member of the New Kent County, Virginia Board of Supervisors, a Professional Registered Parliamentarian Retired with the National Association of Parliamentarians, a member of the American Institute of Parliamentarians, and a member of the American College of Parliamentary Lawyers. 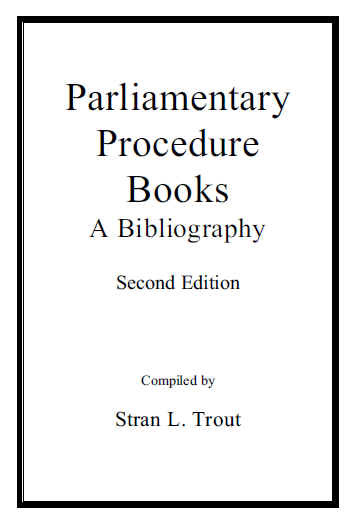 He has been involved in parliamentary procedure and has been collecting books on parliamentary procedure since 1974. He maintains parliamentary information and a list of printings of Robert’s Rules of Order on his web site: www.newkent.net. Bierbaum, Dr. Gene (Eugene), The Parliamentarian of Tomorrow, 2010, 85p, Xlibris Corp.
Enchiridion of Parliamentary Procedure, 1995, National Association of Parliamentarians. Clydebank Media, Robert’s Rules Quick Start Guide, the Simplified Beginner’s Guide to Robert’s Rules of Order, 2016, 81p, Clydebank Business. Delete: Craig, Laura Harris, Lessons in Parliamentary Law, Revised, 1925, R. G. Badger. Erwin Craighead), Lessons in Parliamentary Law, 1st, 1914, 175p +index, W. B. Delchamps Printing Co.
Daniels, Gene; Casey, Larry, Parliamentary Procedure and Effective Union Meetings, 2009, 83p, Union Communication Services, Inc.
Doe, Mary L., Rules for the Conduct of Public and Private Meetings,[late 1800's] 26p, Hurley Bros.
Dopping, Anthony, see E., H. S.
English, Thomas Dunn, The Rules of Order Governing Public Meetings, 1887, This book is sold as a reprint indicating Thomas Dunn English as the author. However, a note from the seller admits that English never wrote such a book. Inside of the cover is a reprint of a book of the same name and date written by F. M. Payne. Freeman, Wm. Marshall and Abbott, J. Carson, The A. B. C. Of Paraliamentary Procedure - A Handbook for use in Public Debate, 1906, 127p, Butterworth & Co. The How and the Why of Parliamentary Procedure, 1971, 189p, Wallace Printing Co.
Leonardy Parliamentarians, Gen. Henry M. Robert & Rules of Order, 1st, 1961, 16p, The Leonardy Parliamentarians. Lewis, John F., Mrs., A Compendium of Parliamentary Law, 7th, 1912, 55p; 10th, 1915, 59p; 21st, 1931, 88p; 23rd, 1935, 88p; 28th, 1948, 88p; 29th, 1949, 88p; 30th, 1953, 88p; 34th, 1968, 88p, Otto Ulbrich Co., Inc.
Litwiller, Hannah, The Young Adult’s Guide to Robert’s Rules of Order: How to Run Meetings for Your Club or Organization, 2016, 227p, Atlantic Publishing Group, Inc.
What Parliamentary Procedure Can Do For You, 1981, 66p, Pioneer Publishing Co.
Mell, P. H., A Manual of Parliamentary Practice, 1867, 91p, Sheldon & Co.
Robeson, Henry J., Parliamentary Rules Compiled from Cushing’s and Roberts’ Standard Works Condensed and Arranged for the Use of Fraternal Societies, 1890, 67p, Boynton & Sons. Stuart, Louis C., Parliamentary Points of Order for the use of General Assemblies, Societies, Lodges, and Other Organizations, 1922, 31p, Webster Publishing Company. Urbaniak, Tom, Action, Accommodation, Accountability: Rules of Order for Canadian Organizations, 2011, 171 p, Writing on Stone Press, Inc.
Walworth, Ellen Hardin, Parliamentary Rules for the use of Societies, Clubs, Guilds, Chapters, Etc., 1897, 24p, J. J. Little & Co.
Waples, Rufus, A Handbook of Parliamentary Practice, 2nd, 1901, 3006p, Callaghan & Co.
Weisgal, Ted, Robert’s Rules for Kids, A Guide to Teaching Children from Kindergarten to the 5th Grade the Rules of Parliamentary Procedure, 2014, 108p, Create Space Independent Publishing Platform. Winchester, Hinda E., Practical Parliamentary Points, 1st, 1930, 61p, Tri-State Printing Co.; 2nd, 1933, 54p, Commercial Printing Co.
Wiseman, H. V. See Hanson, A. H.
..........,American Parliamentary Manual and Political Guide, 1893, 99p, “The Question”, volume 3, No. 6, June 1893, pages 729-827, The New Era Co.
......., Code of the Ancient Accepted Scottish Rite of Free Masonry, 1872, 154p, Hazlitt & Reed, Frat. ......, Standing Rules of the House and Council and Joint Rules of Order, (Arizona) 1906?, 14p, Reprinted by Forgotten Books. ......., Rules and Orders for the Regulation and Government of the House of Delegates of Maryland, 1870, 19p, Reprinted by Forgotten Books. ......., Union Rules of Order, The Laws of Parliamentary Procedure As They Apply to Local Union and Committee Meetings, 1937, 48p, Prepared by he Editorial Staff of The Advance, A. C. W. Of A., The Amalgamated Clothing Workers of America. 1851 eleventh thousand William J. Reynolds & Co.
1874 189 p ninety-fourth thousand Thompson, Brown, & Co.